Loaded with thousands of European Jewish refugees, the Exodus sailed for Palestine in 1947 under the command of Yossi Harel. The ship galvanized support for a Jewish state. TEL AVIV (JTA) -- A white-haired former shipmate propped a gold-fringed, pale blue flag of the legendary Exodus ship next to the coffin of its commander, Yossi Harel. A short distance away sparkled the azure Mediterranean Sea, whose waters Harel sailed four times on clandestine journeys between 1945 and 1948. Those journeys brought a total of 24,000 Holocaust survivors to the shores of what would soon become the State of Israel. Harel, who died April 26 of cardiac arrest at the age of 90, was remembered as a hero by his former comrades, the Jewish refugees he helped bring to Israel and the leaders of the country. He was "modest, a brave fighterand a hero who did not seek acts of heroism," said Shaul Biber, a fellow former Palmach fighter. When he secretly set sail from France on the Exodus, a rickety former Chesapeake Bay steamer originally called the President Warwick, Harel could not have known that the voyage would become legendary. The boat left on July 11, 1947 with 4,553 Jewish refugees on board and headed toward Palestine until it was intercepted by British navy vessels. The British commanders ordered that the refugees not be allowed into Palestine, then under British control, and be sent back to Europe. But the defiant Harel and his skipper planned a daring escape from under the nose of the British destroyer that was escorting them. They shut off the ship's lights in the dead of night and swiftly changed the ship's course, heading for Palestine. The British intercepted the Exodus, hitting the ship’s bow and attempting to board the boat. Passengers tried to repel the British forces by hurling potatoes and canned goods at them. A British soldier and three Jews were killed in the clashes, including an American volunteer sailor from San Francisco, before Harel ordered his passengers to surrender. The refugees were taken to Haifa and put on ships headed back to Europe. Among those who witnessed the dramatic scene of the refugees disembarking from the Exodus in Haifa only to be loaded onto three other ships headed back for the continent were members of the United Nations Special Committee on Palestine. The officials said later that seeing the unfortunate journey of those refugees up close spurred them to push for a resolution of the question of Palestine and the Jews who wanted to make it their home. 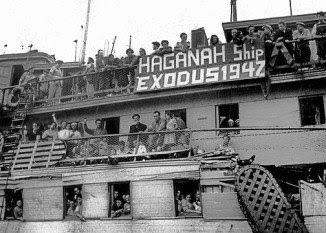 For its role in galvanizing world opinion in favor of a Jewish state, the Exodus became known as the ship that helped launch the Jewish state. The dimensions of its story, including the return of the refugees to Europe and their eventual landing in Germany, was covered widely by the international media. The story was mythologized in the 1958 novel “Exodus,” by Leon Uris, as well as a hit film starring Paul Newman in a loose portrayal of Harel. For Jews and non-Jews, the book and film painted a romantic, heroic picture of the Zionist cause, doing wonders for the young state's image. Years later, in the Soviet Union, illegal copies of the book were circulated among young Jews, turning them into avid Zionists. Among them were the leaders of the movement to free Soviet Jews and allow their immigration to Israel. Harel, who was 28 when he was the Exodus commander, went on to a career in the Israeli army's intelligence corps in the early years of the state. He later went into business and reportedly also worked for the Mossad. During a visit to Los Angeles in 1948 he met an American woman who would become his wife. "I saw a man in uniform facing me, impressive and handsome, and I fell in love with him immediately," Julie Harel was quoted this week by the Israeli daily Ma’ariv. "We were married and since then we were never apart. It's hard for me to imagine life without him.